Last year at Sasquatch, Shakey Graves performed at the small Yeti stage and managed to pack the venue to the brim as fans and music lovers flocked to his bone shaking, hollow-bodied, finger-picking Americana melodies. 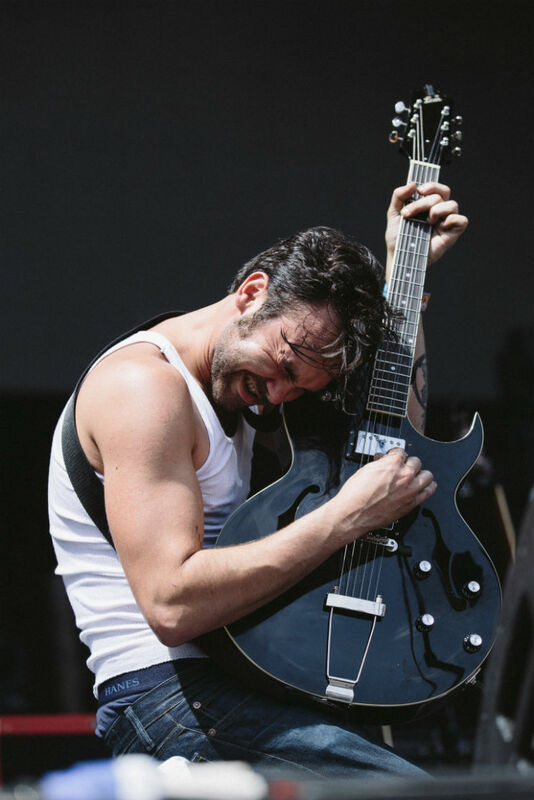 This year, Shakey Graves was performing on the largest stage at the venue, the Sasquatch stage. "I've been waiting all year for this and I hope you're excited as I am to be here," Alejandro Rose-Garcia told the audience. He performed with a drummer and a second guitar/bass player and intermittently played solo, with his trademark suitcase kick drum and a guitar. Garcia and the band were sweating as he picked his distorted, bluesy grooves in the afternoon sun. During "Dearly Departed," from his 2014 release, And the War Came, Garcia announced that Esme Patterson, the female vocalist on the track, couldn't make the show, and asked if the audience could fill in. Enthusiastic fans answered the call easily, nailing every note. To close the set, Garcia growled solo through "Late July" and left the stage with fans chanting for more, right through until his equipment was taken down and the transition music started, a testament to his fan base at Sasquatch.